Brenda Silverman, renowned socialite, respected member of the Johannesburg Jewish community, and wife to esteemed, philanthropic businessman, Alan Silverman, is found dead in her bed in her luxurious Northern Suburbs home. The close-knit community is shattered by this tragedy; even more so when it emerges that foul play is suspected. Fledgling journalist Tracy Jacobs, who is awkwardly trying to find her place amongst her more confident colleagues is sent to see if she can discover the story behind the story. After all, she’s one of ‘them’ (Jewish), and even went to school with one of the deceased’s children. Her mother is horrified that she would even begin to try and hint at something being amiss in the perfect Silverman home. It’s just so embarrassing when the book club ladies are whispering about you behind your back! And so begins a journey to discover what exactly contributed to creating the façade of a ‘Beautiful Family’. We learn about Alan’s extremely humble beginnings during South Africa’s notorious Apartheid era: as a member of the only Jewish family in an Afrikaans farming community he’s subjected to bullying of the worst kind, and not only outside of the home. His childhood is challenging but he soon learns the skills he needs to survive. His brother is killed in action while carrying out his compulsory army service, and Alan decides he’s not following the same path leaving the country, to become a ‘conscientious objector’, much to the disgust of his patriotic family. He moves to a kibbutz in Israel where he meets the impressionable Brenda and decides that this is the girl he’s going to marry. She’s young, shy, impressionable and will be his perfect partner. She is the ideal companion to accompany him on his many unexpected, sometimes exciting, and often downright alarming exploits. She doesn’t challenge him, and seems happy to be the unquestioning wife that the up and coming Silverman requires. They journey to London, where they stay with Annette Davies – anti-Apartheid activist, and ‘Alan Silverman fan club chairman’, and Alan becomes the golden boy of the anti-Apartheid movement. He forms an association with kindly Ben Shapiro, who launches him into the fast-paced business of property, which he uses as a springboard to launch him to professional heights he always wanted to achieve. For Alan Silverman has spent his life trying to prove himself a success, and creating a persona that others will both respect and fear. For all he has every wanted was to be accepted. Back in South Africa after the abolishment of Apartheid, the Silvermans settle into a picture-perfect niche. Philanthropic, wealthy, successful, and now religiously observant and respected in the Johannesburg Jewish community, until tragedy strikes! This is a deep, dark look at the underbelly of what goes on behind the closed doors of a ‘beautiful family’. It’s not based on a particular incident (although the speculation on this is rife! ), but on very thorough research into the ugliness of domestic abuse that, despite people believing ‘it doesn’t happen to people like us’, is very much a sick, daily reality for many more than we realise. It is also an analytical commentary of the workings of a close community – in this case – the ultra-Orthodox Jewish community in Johannesburg. How far will a group of people go to protect one of their own? How long does it take for people to realise that the hideous truth is right in front of them but that they simply refuse to see it? 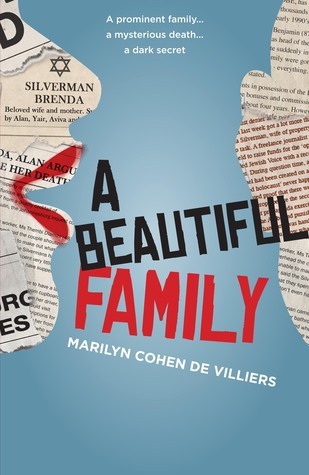 Marilyn Cohen De Villiers has masterfully woven an intricate story, incorporating history, dangerous reality and horrifying truth which leaves us asking: How well do we really know those close to us? How far will one person go to protect what he has created – something that might not even exist?